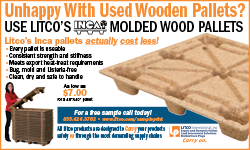 Plastic pallets valued for export: no ISPM-15 worries, lightweight, and more. Based on a pallet designed and utilized for air mail, the Shuert Ex-Air weighs just 10 pounds. Taking a step back, in the course of global trade flows, pests can quickly reach every continent and harm the local agriculture and forests. With this in mind, ISPM 15 (International Standards for Phytosanitary Measures) guidelines have been created to regulate wood packaging material in international trade to prevent the spread of pests. These guidelines require measures such as heat treatment or fumigation prior to eliminate pests and to protect the wood against new infections. Non-solid timber pallets such as those constructed from presswood, paper, metal or plastic are exempt from treatment requirements. Plastic pallets have been in the marketplace since the 1960s, however, it has only been in recent years that their popularity for export usage has really escalated. 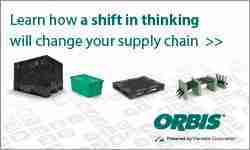 It should be cautioned, however, that there is more to pallet selection than the price tag. The cheapest pallets available might not be the best fit for your application. “Plastic pallets are available in a dizzying array of high tech designs and materials, each of which has a definite place in what is a very diverse marketplace,” noted Hartson Poland of Nelson Company, (https://www.nelsoncompany.com), a plastic pallet supplier. Increasingly, his role has moved towards reviewing the requirements of the customer’s unit load application from the time the empty pallets are unloaded from the supplier, through to palletization, shipment and then handling and recycling abroad. The goal is to match the best value pallet that will guarantee a successful shipment. Getting the cheapest plastic pallet might be a costly mistake if it results in damaged products or problematic business relationships, he cautioned. One important aspect of pallet selection is conforming to the standard pallet footprint size of the country of destination. For example, while the standard size in North America is 48×40”, we see 1165x1165mm in Australia, 1200x800mm in Europe and 1100x1100mm as well as 1200x1000mm in Asia as common sizes. Today, plastic pallets are used for a great many applications in addition to export. 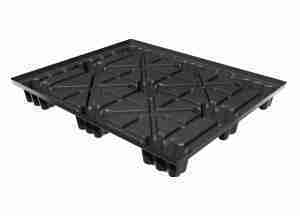 With technological improvements, plastic pallets are designed to give great performance at a lighter weight and with better durability. Next up, our review of export pallets shifts to the increasingly popular paper pallet and the presswood pallet. Due to the increasing cost of hardwood, wood packing is now very expensive therefore plastic packing has become more popular for shipping. It is less expensive and best alternate of wood. Plastic packing represent great savings over wood pallets. 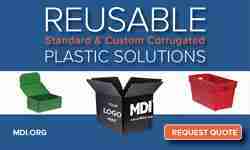 It reduces waste therefore exporters prefer the use of plastic pallets. Thanks for sharing the economic resource of plastic pallets. I agree with your article, our customers prefer plastic pallet of the pallet timber. In fact, almost 80% customer in Indonesia prefer the plastic pallet.